Last week, I hosted another Reading Around the World book discussion at my library. In June, we read Rickshaw Girl and made rotis. Since I picked a "girl book" before, I wanted to choose a "boy book" and this month we read Kampung Boy by Lat and we brought in all different kinds of tropical fruit for the kids to see and taste! Our spread is pictured to the left. We brought in grapes, bananas, pineapple, coconut, mangoes, and dates. The kids were huge fans of the fruit they already knew (pineapple was an especially big hit) and they dived right in to the more "exotic" fruits, too. Collectively, they did not care for the coconut (they're probably used to having sweetened coconut) and they thought the dates looked very strange. After we went through all the fruit and had cut up some of it for the kids to try, we talked a little bit about the book. 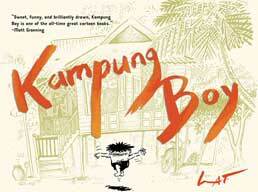 The kids LOVED Kampung Boy and that makes me really happy since I love it, too. I brought out our globe and we looked at Malaysia, almost exactly halfway across the world from us. They noticed that Malaysia is divided into West Malaysia and East Malaysia and I found the spot in West Malaysia where the book is set and showed them. I started off the conversation by asking the kids to tell me what happened in the book. They all spoke over one another, telling about their favorite parts (and there are so many funny bits that they had a lot to mention!). One girl loved when the dad jumps into the river and his towel comes off, one boy couldn't get enough of the policeman scaring all the kids out of hiding by shooting his gun up into the air. Next, I asked the kids how Lat's childhood was different from their childhood here in Indiana. They mentioned that there were only boys in his school, that the houses were different (raised up on stilts), that they ride in cars while Lat mostly walked or rode a bicycle... I brought up how Lat was born at home and asked them where they were born (they were all born in a hospital). The kids were absolutely riveted by the video. One of the boys mentioned that he had heard similar things on the news sometimes when they reported about the Middle East and he asked me how he could find other videos like that to watch at home. We didn't actually discuss the video in great detail, but I was ready with questions for them about the music in whatever religion they may participate in. After we talked about how their experiences were different than Lat's, I asked them how their experiences were the same. The kids had lots of good things to share on this topic, too. They rode bikes, they went fishing, they went swimming with their dads, they went to school. After we had discussed the book a little bit, I brought out some blank comic strip panels that I had printed off the web and invited the kids to draw a cartoon based on their own life the way Lat had drawn cartoons about his life in the book. Some of the kids stayed to do the art activity and some of them took it home to do later. We only had one copy of the book's sequel, Town Boy, checked in. And all of the kids wanted it, so we did a lottery to decide who would check it out that day. The others left their names with me and I put the book on hold for them. One potential red flag if you're considering this book for a book discussion is that there's a brief section where Lat discusses the rite of circumcision. It's not done in a graphic way at all, but you might want to prepare in case that comes up in your conversation. It didn't come up in our discussion, but I was prepared to tell the kids that it was a religious and cultural rite of passage. I would have asked them if they have any rites of passage in their religion (think: bar mitzvah, first communion, etc.). All in all, it was a very successful program and I think I might revisit it next summer, even though the Summer Reading Club theme will be different. Even though we didn't have huge attendance numbers, I think the kids who came had a great time and learned a lot. Plus, it's great to give exposure to awesome multicultural books. If I do this series again, I will definitely have kids register when they pick up the book. Almost all of our books were checked out for both titles, but I think people forgot to come to the discussions. If they registered, I could call and remind them.